This program runs a one-sided auction in which sellers post prices independently on a take-it-or-leave-it basis at the start of each market period or "round." Buyers then place orders at the posted prices, so buyers are not simulated. Posted prices are characteristic of many markets where individual negotiation is not possible. This institution is often found where one side of the market is "thinner," as is the case with retail markets with large numbers of potential buyers. The program collects and displays price information. Market efficiency is measured as the fraction of maximum possible value created by the trading process, i.e. the ratio of the sum of all buyers' and sellers' earnings to the maximum possible value of this sum. Setup parameters include demand and/or supply shifts and buyer and/or seller communication. 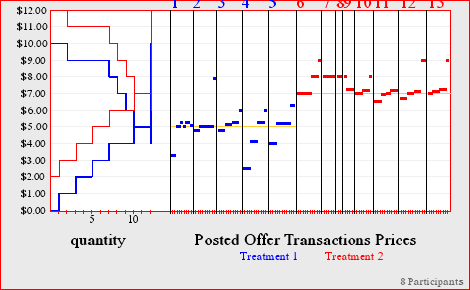 For an introductory discussion of behavior in laboratory posted offer markets, see Holt (2006), Markets, Games, and Strategic Behavior, Addison-Wesley, Chapters 8 and 9. A seminal paper on the posted price process is Plott and Smith (1978) "An Experimental Examination of Two Exchange Institutions," RE Stud..